Our diverse capabilities provide cost-effective solutions for creating subassemblies. Cannon’s assembly work spans across a wide range of business applications with particular experience in office products. We offer both mechanical & electromechanical services for the automotive, construction, military and office product industries. 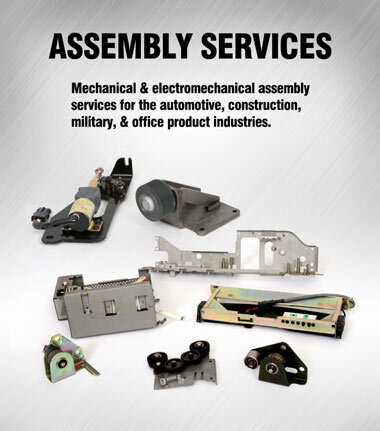 Cannon offers capabilities in both mechanical and electromechanical assembly, and makes a variety of components and subassemblies for the office equipment business as well as commercial applications for the automotive industry. Our largest growth sector in assembly is in the area of gensets or outdoor generators that residences and businesses are using in case of power outage. Recent hurricanes and other disasters have increased the demand for those products. Cannon’s assembly work spans across a wide range of business applications with particular expertise and experience in office products. Fare boxes that we assemble provide cost effective solutions for dispensing rail and subway tickets.